The Ravalli County Museum and Historical Society, will be holding its 1st Annual Antiques & Collectibles Auction. This fun event will be held on Saturday, April 20, 2019 at 12:00 noon at the museum, in the Courtroom Gallery. Your opportunity to preview auction items will be on Friday, the 19th from 10 am to 4 pm and on Saturday, the 20th from 10 am to 12 pm. 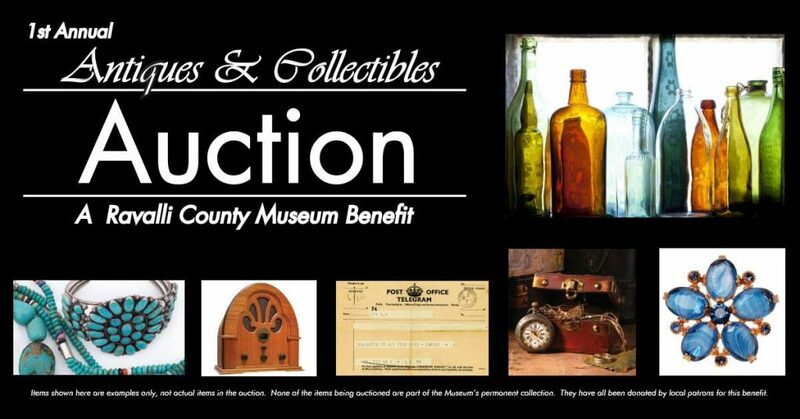 All items have been donated by local patrons to the museum specifically for this auction. None of the items are part of the Museum’s permanent collection. Proceeds will benefit the Museum’s mission and educational programs. Special Thanks to David and Julie Bethman for their dedication and support in creation of this event.